WORK & ART - mathias-heins-malereis Webseite! Mathias Heins learned his craft at German theaters and used to work in stage painting. After exploring the graphics as an illustrator, the artist now devotes himself exclusively to painting. He is interested in sharing and interacting with other international artists. In addition to the impressionistic interpretation of landscapes using the means of oil painting, Mathias Heins has put his focus on abstract acrylic painting. In the non-objective art form his craft comes to its full advantage. 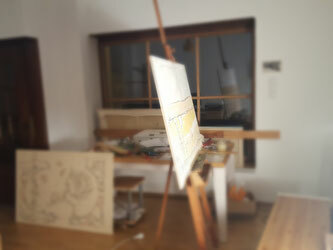 Visitors are welcome in the studio by prior appointment.